Microsoft has announced a mandatory update of the Digital Signature system from SHA-1 to SHA-2. Preparing your digital signatures and signing your installers according to this update is vitally important because starting with January 1st, 2017 Windows will no longer trust installers with a SHA-1 signature (file hash or timestamp). Read more about how Advanced Installer can help you get through this transition in the SHA-2 Digital Signature Upgrade article. Digitally sign your installers in Advanced Installer using a SHA-2 certificate to ensure they pass the UAC and Windows SmartScreen check. The above screenshots were taken using Advanced Installer's install package itself as an example. 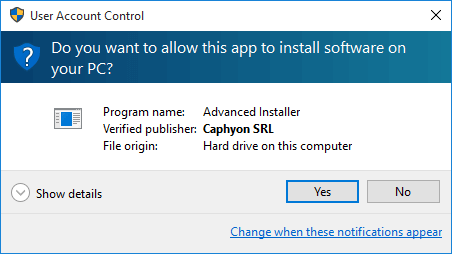 When you sign with your own digital signature, your own company and product will appear as the publisher instead of "Caphyon" and "Advanced Installer". Advanced Installer allows you digitally sign any eligible file included in your installation in a single, simple, integrated build step. Furthermore, all executable files generated by Advanced Installer (Updater, AutoRun launcher, Java Native Launcher, etc.) are marked to be signed as soon as a digital signature is provided. By also signing patches you can enable least-privileged user account patching without UAC elevation prompts on Windows Vista and above. 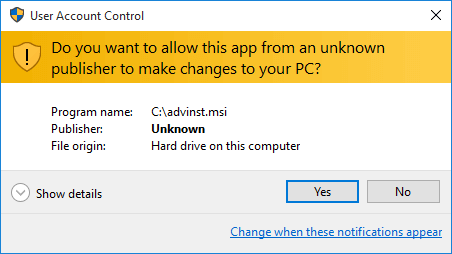 Signing all install archives allows Windows Installer to verify their integrity and detect possible corruptions before installing. Sign your VSIX, Add-In or AppX packages and give your customers peace of mind that your software is genuine.